Anubhav Mohanty is one of the biggest superstar in Ollywood on these times. 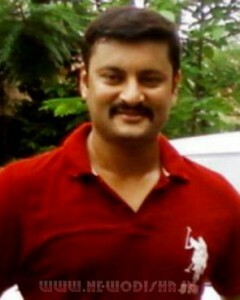 See the full profile, personality, Biography, Wallpapers and Contacts details of Anubhav Mohanty Here. Anubhav Mohanty was born on 24th December 1981. He is an Ollywood and Bengali actor in the state of Odisha in India. Anubhav Mohanty made his debut in the movie I Love You in 2004 opposite Mumbai based TV actress Namrata Thapa. He got stardom from [i love you] . He attained mega star status in 2006. In 2012 after the success of Balunga Toka he created his own production house named Vishnupriyaa Arts & Graphics. The very first released Oriya movie Something Something was the biggest hit of 2012. It ran for 115 days in Odisha and Bengaluru simultaneously. It is the only Oriya movie till date that has ran 115 days in Bengaluru. Anubhav made his debut in Bengali film industry with the movie Saathi Amaar opposite Rachana Banerjee in a special appearance. He completed his schooling from DAV public school, Cuttack, Odisha.He did his graduation in commerce from Christ College, Cuttack. He got married to Oriya actress Barsha Priyadarshini on 8 February 2014. He started his career appearing in Oriya albums. He has featured in around 20-30 Oriya album video songs before debuting Oriya Film Industry in the 2004 film I Love You opposite Namrata Thapa, which was a Blockbuster in Odisha. He had two other releases the same year, Saathire and Barsha My Darling which were moderate successes. He was nominated for “Taranga Best Critically Acclaimed Actor” for his outstanding performance in the movie Abhimanyu. He is currently one of the highest paid and a much-sought-after actor in Ollywood. In the year April 2013, he ventured into politics. He joined the regional party BJD (Biju Janta Dal). 2014: Best Actor for Hata Dhari chalutha (Tarang Cine Awards). 2013: Best Actor for Something Something (Tarang Cine Awards). 2012: Lalchand Superstar Award (Lalchand Entertainment Awards). 2012: Best Actor for Balunga Toka (Tarang Cine Awards). 2012: Chatrapati Sivaji Upadhi (Cinema Sansara Award Ceremony). 2010: Best Actor for Deewana (Etv Oriya Film Awards 2010). 2009: Best Actor for Akashe Ki Ranga Lagila (Orissa State Film Awards). 2009: Best Actor forAbhimanyu (Tarang Cine Awards). 2007: “Best Action Hero 2007” for Kali Sankar featured in Oriya & Bengali. (Anandalok Awards). 2005: Best Debut actor for “I Love You”. Give Responses for "Anubhav Mohanty – Odia Actor Profile, Biography and Wallpapers"